HOST: That’s the sound of half a million people watching the ball drop in New York’s Times Square on New Year’s Eve, 2002. As revellers set off to go home or back to their hotels, out of the cold, they probably weren’t thinking about those who couldn’t go home, because they were homeless. BECKY: When Rosanne hired me in 2003, there were about 55 people sleeping outside – rough sleeping as you guys say, in the middle of winter.. really really cold conditions. HOST: That’s Becky Margiotta. The Roseanne she’s referring to is Rosanne Haggerty who ran a non-profit housing agency. She hired Becky find new ways to get Times Square’s homeless into homes. But there was a problem. Scarce housing was usually allocated to those most likely to escape the homelessness trap on their own – the recently homeless who were healthier and had fewer problems than their peers. But many of those living around Times Square had been there for years. So Becky took a different approach. Today we are looking at how that experiment in New York has changed the way homelessness is dealt with in hundreds of cities across the United States. And what happens when an outsider looks at a problem with fresh eyes. Lets go. We are supported by the Sydney Policy Lab at the University of Sydney. They break down barriers between researchers, policy makers and community campaigners so we can build change together. Check them out at sydney. edu.au/policy-lab. HOST: If you’re looking for a seemingly insurmountable problem – then homelessness is a pretty good place to start. BECKY: I think if you look at the psychology of how we think of things in America, I think that there’s an overall general sense that housing is not a right, that it’s something to be earned and that some people have earned that right and others have not. HOST: Becky had never really thought much about homelessness until she was in her early thirties. BECKY: Prior to that I had served in the military for about nine years as an Army officer and then got out of the military, so I didn’t have to lie anymore about being gay – and, through a weird set of circumstances got a job as a stockbroker, and I was a stockbroker for a few years. HOST: Roseanne Haggerty’s non-profit, Common Ground, ran the Times Square Hotel – America’s largest supported housing complex. But homeless people were – quite literally – living on its doorstep. Roseanne thought a person with a military background would have the logistics skills, leadership, and focus to get them into housing. Becky had never heard of the Times Square Hotel, but she had a deep personal connection to it. Her father told her. BECKY: Gosh, I should check with your mom, but I think you were conceived there. HOST: Roseanne told Becky that the UK had been trying new methods that seemed to be working. BECKY: She had gotten this from the Rough Sleepers Initiative in the UK started by Louise Casey in Tony Blair’s administration. She saw that they had reduced rough sleeping by 75 percent over four or five years. She said, “Let’s do that here.” So she said, “I don’t care about what anybody else is doing. You go out there and you get homelessness down by two thirds in three years”. HOST: If someone said that to me, I’d be freaking out. But Becky was in a different place. In a way it was lucky she didn’t have the experience to know what a tall order this was. BECKY: There were 13 organisations that had government contracts to help, in air quotes, the homeless people who lived there, but nobody had any contracts to resolve their homelessness, to actually get them off the streets. HOST: Homeless services had traditionally provided food, blankets and the like to those on the streets – as well as homeless shelters. But a shelter is not a home. BECKY: And the mindset, the mental mind map at the time, was – they have a right to shelter. So if they’re not accessing that, it must be because they don’t want the shelter, and if they don’t want shelter, then we can assume that they don’t want housing either. HOST: But all this was based on assumption. So Becky decided to not assume anything. BECKY: And so we went out and we actually asked people on the streets, like what do you want? MARK: No homeless person has ever said, “Would you please put me in a room with a hundred other men, put us on cots, give us two bathroom stalls, have us stand in line for showers and meals, and then kick us out every morning at five thirty in the morning. And that’s going to cure my drug addiction and mental illness. No homeless person ever, ever said that. HOST: That’s Mark Horvath, who had been homeless in LA in the mid-1990s. In 1995, I sold pictures of my iguana to tourists on Hollywood Boulevard. I was wasted – crazy out of my mind wasted. HOST: We’ll be hearing more from Mark later. When Becky asked homeless people what they wanted, the answer was similar to Mark’s. BECKY: And they said “I want my own apartment, I want my own place to live. I don’t want shelter, I don’t want to do other stuff. I want my own place to live.” And there wasn’t a mechanism. There was no structure to get them from the streets into a home. It just didn’t exist. HOST: Homeless people tend to be homeless for a reason. They may have debt, a criminal history, drug and alcohol addiction, or physical – or even more commonly, mental – health conditions. Traditional housing programs said, okay, you’ve got to get off the drugs, and get healthy before you get permanent housing. BECKY: But I had heard about and met Dr. Sam Tsemberis, who’s a community psychologist, who came up with this notion of “housing first”. HOST: Housing first. The thinking is simple: get people into a home, a real home, first. Then, once they have a stable roof over their head, it’ll be easier for them to address all their other problems. Becky convinced Common Ground that providing permanent housing should be their first priority. Housing first wasn’t a new idea. It had been tried before, but usually, the people running the trial would cherry-pick the easiest cases: the recently homeless. As a result, a housing first approach was not seen as a way to deal with those who had been out on the streets the longest. This time, Becky wanted to try something new. So, she created the Vulnerability Index. The Vulnerability Index would allow them to identify the people who were most at risk of dying. BECKY: We were able over four years to get street homelessness down by 87 percent. It was called Street to Home. News of its success spread. In 2007 Zev Yaroslavsky of the LA County Board of Supervisors picked up the phone and asked Becky and Beth Sanders from Common Ground to help set up a housing first program at the epicenter of US homelessness – LA’s Skid Row. The County wanted to house the fifty people on Skid Row who were at greatest risk of dying on the streets. They called it Project 50. It was fine to say let’s house the fifty most vulnerable. But how do you know who they are? So they came up with a way to gather data quickly. BECKY: The main intervention we had at first was something called a registry week. And what that looked like was on a Monday, me and Beth would train your volunteers that you had already assembled. And so we taught people how to do these surveys, just plain old volunteers, no experience in human services. And then Tuesday Wednesday Thursday mornings, from 4:00 to 6:00a.m., the volunteers got a sector of their community that they went to each morning. And we figured over three nights, we’ll get most of everybody. And then Beth and I would do the data entry all day into this little system that would tabulate who was the most vulnerable and rank them and turn around by Friday morning PowerPoint presentations – the community essentially had the pictures of here’s who’s going to die if you don’t do something differently. HOST: The volunteers also photographed the homeless people they surveyed. BECKY: And then the actual pictures, and when we’d show the pictures of here’s who’s going to die if you don’t do something differently, People would gasp and cry and be like, “Oh my gosh, I know that person”. And it was real. HOST: Registry week was a game-changer. It engaged volunteers, rather than social workers, which meant broader community buy-in. BECKY: Other cities saw it and said you can do that with us. And we said sure…. And so, and then we did it at Santa Monica, and then New Orleans heard about it and they wanted us to go do that with them, and then Washington D.C. So Beth and I spent two years going from city to city, working with them to identify people who are at the most risk for dying on their streets and learning from them what they did. And the most exciting thing was those cities started doing things that were actually much better than what we had done in Times Square originally, like they got super innovative themselves. HOST: Which made Becky and Roseanne start to think. BECKY: How can we take this work over the last couple of years, that’s gotten maybe 20 cities, has housed maybe 2000 people, to be something that’s bigger than the sum of the parts? HOST: It was the right question to ask. The American economy had crashed in 2008, and more and more Americans were being evicted from their homes. Tens of thousands of people across America were being forced onto the streets for the very first time. That got Becky thinking. A few years before, she’d heard about Dr Dan Berwick. He had begun something called the 100,000 Lives campaign. So here’s what I think we should do. I think we should save 100,000 lives. I think we should do that by June 14, 2006, 18 months from now. Some is not a number. Soon is not a time. HOST: Don’s words now resonated with Becky. Her campaign needed a clear – and ambitious – target and timeframe. BECKY: So it’s not like we thought it up and did it. We actually co-created it with all the people who had been in the early adopters. 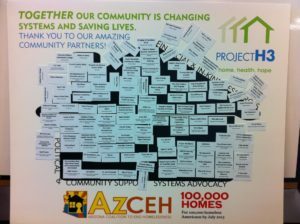 HOST: The 100,000 Homes campaign was born – with the mission to house 100,000 chronically homeless people in three years. I’d just like to point out a pattern here. Have you noticed that Becky and Common Ground keep pinching ideas that work in other places, and then adapting them. They pinched their Housing First program from the UK when they saw that it worked. And now they were doing the same with 100,000 Lives. Or to put it another way, when the evidence showed that something worked, they followed it, rather than sticking to what had always been done before. It also meant they took an evidence-based approach to choose their targets. BECKY: So what we did leading up to launch was identify the 55 cities in the United States that had more than 1000 people experiencing long term homelessness. And we essentially made a “we want you” list and we published it at the launch and said if you have more than a thousand people we’re coming after you to be part of this thing. MARK: So, this is one thing the homeless service sector does wrong, is they come in and they say this is what we feel you need, instead of listening to the person and trying to figure out what they need. HOST: Remember the Mark Horvath? The iguana guy who had lived rough in LA. Mark now empowers homeless people to tell their own stories on Invisible People-dot-TV. The 100,000 Homes campaign had no initial buy-in from people who’d experienced homelessness. So they decided to set up an advisory committee and include people who had been homeless. MARK: I was on the very original Leadership Committee, where I was flown to Vegas one time with stakeholders and I was involved in the very first bootcamp… I helped amplify their voice through my network. I would do social media training. They helped promote that we are visible, which is part of my digital inclusion. HOST: The campaign used social media to share the experiences of homeless people – and the way housing first programs had improved their lives. VIDEO: I have so many photo albums, but when I became homeless I was only limited to enough, you know, that I was able to carry around with me. I don’t have to keep them in a bag now. I can hang them up. Everyone who means a lot to me is on that refrigerator – you know, my grandkids, my kids, my mother, my grandmother. And me – I’m on there too. HOST: But the main way 100,000 Homes got its message out was good old-fashioned boots on the ground. MIKE SHORE: I mean literally tons of phone calls, taking trips out, you know, going to all the various conferences in different states and regionally, just talking to whoever we needed to in order to explain what this thing was. HOST: That’s Mike Shore, who joined 100,000 Homes’ central campaign team in 2012, after having coordinated the local campaign of Phoenix, Arizona. Mike was initially sceptical of Becky and her vision. MIKE: My initial response was to be a bit of a naysayer, I didn’t think what worked in New York City was going to work in Phoenix and in other parts of the country. But I think what changed my mind was she brought so much joy to the work, both her and the team nationally, and the support that they provided to us as a local community and in the campaign. HOST: The greatest strength of the campaign was the development of a shared sense of community – of an “us”. BECKY: So we used grassroots organizing from the very beginning to help support creating the “us”. And then we just, we, we built that into everything we did. HOST: But they had a big problem. Many of the communities they were going into were scattered and didn’t talk to each other. How could they get people to join a single vision when they don’t even talk to each other? MARK: But I think more so than, than policy, what 100,000 Homes, from my opinion, did tremendously was the community organising. Because you have so many different stakeholders and each community is so different. They had a very unique ability of going into a community and getting people to work together. HOST: The community organising was about fostering genuine relationships between people, some of whom were working together for the first time. And they did this organising at the registry weeks. They’d start on a Monday. BECKY: What we created was, by Friday the whole community will come together, including mayors and local authorities, and we create an emotional catalytic event for them, that, then they might have gone into the work saying like, “OK, we commit to housing the 10 most vulnerable people”. But by the time that Friday briefing was over, we’d have elected officials pounding the gavel and saying, “we’re going to house every one of these”, you know, and we’re like this is great, right. HOST: Shannon Nazworth, works with homeless people in Jacksonville, in North-east Florida. She says that when her community joined the campaign, their approach was a bit of a shambles. SHANNON: We also really had some organizations that were working very hard, but they were very siloed, segregated. There wasn’t a lot of coordination and alignment of resources and efforts. HOST: But the sheer ambition of the goal meant that they quickly gained buy in from all the disparate stakeholders. It gave them something to organise around. SHANNON: It’s not about one agency doing things. It’s about having partners and each partner being a strong organization working towards a common goal. HOST: The campaign’s aggressive goal was a critical factor in its success. Aiming for the stars is a way more attractive proposition than gradual change in due course. BECKY: And there’s this suspension of disbelief of something really grandiose and ambitious and – 100,000 people in housing – and from the moment I committed to “we’re going to house 100,000 people”, like I was already living in that other reality. That kind of makes you a little bit insane, because it’s not reality reality, but you have to already be in that space so that you can invite everybody there with you. HOST: Although people accepted Becky’s invitation to be on her rocketship, many of them arrived late to the party. Jacksonville had a goal to house 100 people during its first year with the campaign says Shannon. SHANNON: And the first four months, where we did our registry week, it was very successful. We had a lot of volunteers. It went very smoothly. We gathered all the data. We identified our most vulnerable persons and then we didn’t house anybody. We didn’t house anybody for several months, it was really quite disheartening. Part of it was needing to change some systemic things. People had policies and procedures in place that made sense 5, 10 years ago when they were implemented, but they were unintentionally creating barriers and time-lags. HOST: Becky knew that a big ask was now looking a whole lot bigger. BECKY: So the biggest challenge was that, there’s, it’s one thing to get people kind of pumped up about housing their most vulnerable people and it’s another thing to actually help them create systems that do that. And so, business as usual are the systems within which most communities process a person going from the streets into housing is just quite terrible, you know, and it’s just inefficient and it makes no sense. It’s like sending your most, the people with the least ability to navigate it, to your most awful government bureaucracy. What we realized about halfway through the 100,000 Homes Campaign was that unless every community doubled the rate in which they were housing people through these very bad systems that weren’t designed to house people efficiently, there’s no way we’re going to get to the 100,000. HOST: It was a disaster. The only way to meet their targets was to change the whole system. And that felt impossible. Mike Shore joined the central campaign just as reality began to dawn. MIKE: And I think the very first retreat that I went to is where we quickly determined that we were going to be the 30,000 Homes campaign at the end of the time period that Becky had declared at the launch. HOST: When a campaign isn’t hitting its targets, sometimes people start ignoring the targets – but the 100,000 Homes team didn’t do that. To hit the target, the system needed to change. But to change the system, they themselves needed to change. NADIM MATTA: Rapid results work – this work is about unleashing local capabilities. HOST: The institute had a three step method for running a national campaign at scale: set an ambitious short-term goal, appoint a coach to keep each local team on track, and then create competition between the local teams in order to bring out the best in all of them. Communities participating in 100,000 Homes were, on average, housing 1.3% of their chronically homeless each month. The campaign set a goal for each community to up that to 2.5%. 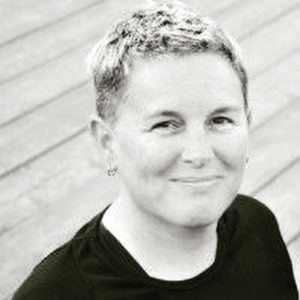 SHANNON: That was our goal, on a regular basis to maintain that, which was how we kind of maintained our momentum, maintained our accountability, and maintained that sense of urgency of having a specific deadline, monthly deadline, to achieve certain numbers so that we could be sure to meet the ultimate goal. HOST: The campaign established the 2.5 Club and publicly recognised the performance of communities that hit the 2.5 per cent target for three consecutive months. SHANNON: The 2.5 club was very important for Jacksonville. Everybody wants to be part of the elite class. When you’re in a competition like this, a friendly competition like this, and so when that when that goal was set up, we all worked hard towards achieving it. HOST: Phoenix in Arizona and Salt Lake City in Utah had a similar number of chronically homeless veterans. Mike Shore is from Phoenix. MIKE: And so we ended up striking up friendships with some folks out there and had an opportunity to introduce some level of competition that eventually became a challenge, if you will, between our two mayors. HOST: The mayors of Phoenix and Salt Lake City announced a race to see which city could get to zero veteran homelessness first. Soon, other mayors joined the race. Another part of their new strategy was to introduce bootcamps. The Federal Department of Housing – HUD (hud) – heard about them, and got involved. And so bootcamps became just a really great way to transfer a lot of knowledge to a lot of people in a relatively short period of time in one setting. HOST: The Rapid Results Institute was all about changing the way the local teams operated, in a hurry. They gave the teams just 100 days to turn things around. This urgency played a critical role in the bootcamps’ success. BECKY: So the beauty of Rapid Results is they, those teams choose their own goals of what they’re going to achieve over 100 days and then they get, they have the opportunity to ask for waivers or permissions to, to kind of do, do things differently than usual, to innovate, and HUD is right there in the moment to say, “Yes you can do that”. BECKY: They were set loose to innovate and over 100 days we had a lot of cities that quadrupled their housing placement rates. HOST: For Shannon Nazworth, the bootcamp was the catalyst for Jacksonville turning its performance around. SHANNON: And in that day and a half, we really embraced an incredibly aggressive goal of housing 100 people in a hundred days. Now, I’ve mentioned our original goal was a hundred in a year and we had failed to meet that… And here, we decided in a day and a half, that we were going to do 100 people in a hundred days. And we actually ended up exceeding that goal. SHANNON: So, I think the ambitious nature of the goal is very important. Having a really ambitious goal stretches your imagination and challenges you in ways you haven’t been challenged before. HOST: The new minimum targets set by 100,000 Homes required housing organisations to collect data on homelessness in a way they never had before. SHANNON: You need the data, you need to know who you need to help, what you need to do to help them, and measure your progress. And you need the deadlines to hold yourself accountable to moving as quickly and aggressively as possible. And that’s what the entire initiative was all about. HOST: By the end of the campaign, Jacksonville had housed 760 chronically homeless people, smashing its earlier unmet target out of the ballpark. The average monthly chronically homeless housing rate of each participating city increased from 1.3% to 4.7%. BECKY: And so ultimately we ended up with 186 cities that were willing to fundamentally transform the way they approach street outreach in such a way that collectively they could house 100,000 people. HOST: Becky is actually underselling 100,000 Homes’ success. By the time the campaign closed in 2014, the 186 cities had housed over 105,000 chronically homeless people. The seemingly impossible was proven possible. INTERVIEWER: What was the most important social change lesson you learned in running this campaign? BECKY: That the, one of the most important jobs of the leader of large scale change is to, you have to have one foot in the future. HOST: Vision matters. And vision is powerful, when operations are held accountable to that vision. But Becky believes the campaign could have done some things better. BECKY: But, but we at the beginning made a pretty, pretty big error in, in accidentally taking credit. HOST: Sorry, what? Taking credit was an error? BECKY: So people were afraid to join the campaign because they thought we would try to take credit for their hard work. MIKE: And I think I was just a little bit, perhaps, turned off by the fact that we had not received any recognition for that work – and it was always, you know, credited with, or the folks in New York State were credited with being kind of the pioneers of a lot of this work. BECKY: And so this currency of recognition is something that’s really important to cultivate and that you want to be a giver of recognition versus a taker. HOST: You might be setting central goals, but the credit has to go to the people actually delivering on them. The answer is “yes”, but not an unqualified one. Housing placements slowed down in the later stages of the campaign, as it became clear the 100,000 target would be met. But still, they got 100,000 people into homes. And after the campaign wound up, in some communities like Jacksonville this movement turned into lasting change. SHANNON: Sometimes you can do a big audacious goal that you can do for that one time, but you’re not going to be able to repeat it. And for our community, it was really important that we use this initiative as best as we could to create lasting change. HOST: But other cities lost their focus on homelessness, and others still became so obsessed with housing first, that it became a mindless default solution. MARK: The downside of what’s happening now is it’s gone so far into housing first. Housing first works great as a model, but it’s not always implemented properly, nor is it maintained always with support services. And to be frank, there’s non-profits that probably shouldn’t be doing housing first, but because that’s where the money is, they go after that money. HOST: And Mike Shore says that despite the campaign, the economic forces that create homelessness are still as present as ever. MIKE: And really, you know the sad thing is, is that since the campaign’s conclusion, you know, our country is facing one of the most severe housing affordability crisis that we’ve seen in generations. And more and more people are struggling to stay housed and are becoming homeless at a real rapid rate. And you know, we, I think we know how to end homelessness. I think we learned a lot in the campaign. We know how to do it. There’s just insufficient resources available. HOST: In some ways the lasting legacy of 100,000 Homes is not that they managed to get homes for 100,000 people — which, by the way, is an extraordinary feat — but the fact that they worked out how to scale a campaign so effectively. They learnt the power of a target, and how it can force change on a system. That sometimes, being ridiculously ambitious is not that ridiculous after all.